Someone's turning 10 next week! I can't believe a decade has gone by with my oldest daughter. 10 years of fun, many many laughs, love, and growing up! Sometimes I wish I had a time machine! Cute pic and I love the new header. It's incredible; how fast they grow up, isn't it? Happy Birthday, DQ! Oh, my, you have a kid in double digits...it happened too fast, didn't it? LOVE the picture, she is a beautiful baby!!! 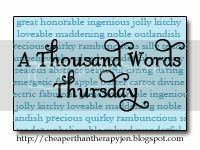 I can't believe I am one of the first ones for thousand word thursday, i am on the ball this morning!! Wow,I'm first to leave a comment today! She is beautiful! My pic is of my middle boy who turns 10 next year! Time flies when you're having fun! Enjoy every moment! My oldest will be 17 in May. And my youngest will be 1 in June! what a cute pic! Can you believe it has taken me this long to join in! That pic is adorable! Doesn't time fly by? It was so hard when Roslyn was a little baby, but I wish I could go back in time and do it all over again. When you get that time machine, can I borrow it? I promise I'll fill up the gas tank when I'm done and clean up all the diet coke cans off the floor. That baby is just so cute.. I wanna just take a little bit of those arms! My youngest will turn 6 in February... don't know why but that just blows. my. mind. My oldest will be 8 in February but I'm ok with that. But my baby will be 6! 6!!! awww they grow up so fast! I love the new header and vector image!! :-) Your friend did an excellent job. p.s. I am diggin' the new header on your blog. Awesome new look on the blog!!!! Love it! Time goes way too quickly with kids. Wish it would slow down to a crawl..amazing how we think that and then most days we are ready for bedtime to get here. Guess it goes both ways,huh? oh how cute!!! And..I like your new header!!! What a cute baby. 10 years, wow! I bet she is excited about the double digits. Time goes by so fast, especially when you don't want it to. 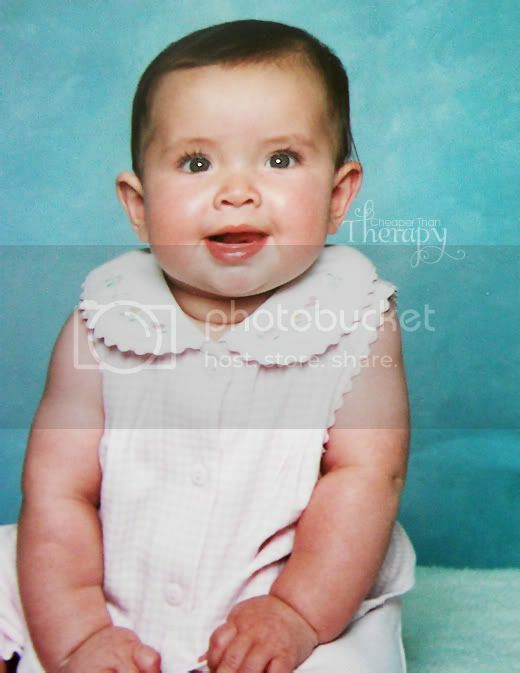 What a beautiful baby picture hope she has a very happy birthday. Alright, girl -- did you make that version of your herself in the header? And HOW???????????? So sweet! It all goes too fast, doesn't it!?!? Nice job on the header - love them colors! OMG!!! That is the coolest heading EVER!!!! That girl looks just like you! And your baby, she is so fortunate to have good genes and look like she does! Remind her constantly she is so lucky to NOT have an ugly mom. She is so pretty, Jenn!!! I posted baby pics too! what a cute picture, i know it goes fast, where did our babies go? Ten is such a great age! Cute picture. It's all over now...welcome to hell! Just kidding. Well, sort of. But not really. Happy Birthday next week, DQ! Glad you are having fun with it...and thanks for the pluggo!! How weird! My link didn't link this morning! I was second. I was just checking to see and my comment is there b/c I thought maybe I was half asleep this morning or was I dreaming?! Great picture and I LOVE, LOVE, LOVE the new header - really, really great - I mean it!!! I used to squeeze and squish and pinch and hug and bite (not hard) little hairy 'till he started to cry...je-je then I would stop...no wonder my kids are so wierd I drove them nuts! When you get your hands on that time machine.....I want one too!!!! Love the new Header!!! She is just too cute!!! Gotta heart those eyelashes, totally not fair! I love the new vector-you..very cool!! Goes by fast don't it? yeah its a real toe tat. i haven't met anyone else with one! WOO us! Those little baby arms! Ahhh! So cute. I can't believe your DQ will be 10 next week...you don't look old enough to have a 10 year old, woman! Thanks again for the guest post today! p.s. Love that you have that song from Juno on your player!! Look at those wonderful wrist rolls!!! Adorable! adorable picture! I see a lot of K in this picture as well! Well Happy Early Birthday! What a cutie! I will be saying the same in 2 years! Ten???? What an adorable picture - I just love her all chubby and cuddly like that! Cool idea, a thousand words on Thursday, and yeah, those wrist rolls? Too much!! !